New York, NY - May 22, 2014 - As the beach season is about to begin with summer unofficially kicking off this Memorial Day weekend, the Long Island Rail Road is offering special fare packages to get you to 12 of Long Island’s sandy destinations. These special beach package tickets are available throughout the summer. With a brand new boardwalk and new food vendors, beachgoers can enjoy the ambiance of a seaside resort, just a short train ride from Penn Station, Brooklyn or Jamaica. Just a few blocks from the LIRR's Long Beach Station, Long Beach offers unsurpassed ocean swimming, summer concerts and Arts & Crafts Festivals. The discounted package ticket includes one-day round trip rail fare to Long Beach, free shuttle buses, admission to the beach and a voucher for discounts at local merchants. The special package fare is $22.00 from New York and Brooklyn, and $18.75 from Jamaica. Hourly service is available from Penn Station, Brooklyn and Jamaica with direct weekend service from Penn Station. Weekend service starts May 24. LIRR weekday service begins June 23 and continues through Labor Day, September 1. Jones Beach State Park offers miles of sandy beaches and refreshing ocean surf. A two-mile-long boardwalk, games, playgrounds, and swimming pools are also available at the park. The discounted package ticket includes round trip rail fare to and from Freeport and bus service via the NICE N88 to and from the Central Mall, and the East and West Bath Houses at Jones Beach. Train service is available approximately every half hour. For bus schedules, visit www.nicebus.com. The special package fare is $18.75 from New York and Brooklyn, and $15.25 from Jamaica. Weekend service starts May 24. Weekday service begins June 23 and continues through Labor Day, September 1. Customers can save on a Jones Beach concert experience by using LIRR beach packages. The Jones Beach Theater 2014 summer lineup is once again packed with the hottest superstar musical acts today! Bus service is available before and following each performance and the package will remain available through the final concert date (September 4). The LIRR offers special packages to ten Fire Island beach locations. Fire Island provides an opportunity to leave the car behind and enjoy miles of boardwalk, trails and pristine beaches. Packages are for same day use only. Intensely informal, carefree and easygoing, Kismet is known as a great community with something for everyone. Amenities include a couple of full service restaurants, two public tennis courts, a basketball court, and playground area. Just a half-mile from the beach is the 150 year-old-plus Fire Island Lighthouse. General admission to the Lighthouse is included in the package. For information and events visit fireislandlighthouse.com. The special package fare is $36.75 from New York and Brooklyn and $36.25 from Jamaica. For children 5-11 years of age the fare is $20; Children must be at least 42" tall to climb the lighthouse. The LIRR package begins May 24 and continues daily through Labor Day, September 1. Home to over a dozen restaurants, hotels, and endless attractions such as sidewalk sales, live bands, and innumerable shops and boutiques, Ocean Beach is truly the 'cosmopolitan' center of Fire Island. For the ultimate seafood experience by the water, or to just unwind and take in the charming atmosphere, Ocean Beach has it all and it's a great family destination. The special package fare is $32.75 from New York and Brooklyn and $32.25 from Jamaica. For children 5-11 years of age the fare is $16. The LIRR package begins May 24 and continues daily through Labor Day, September 1. One of the most relaxed of the Fire Island communities, Ocean Bay Park has a mix of families and singles. Bay-front dining is available at two of the four restaurants. There is also a grocery store, two pizza places and a bagel shop. The special package fare is $32.75 from New York and Brooklyn and $32.25 from Jamaica. For children 5-11 years of age the fare is $16. The LIRR package begins May 24 and continues daily through Labor Day, September 1. For a schedule of Bay Shore Station ferry departure times visit http://www.fireislandferries.com/. Known for its fun, party scene, Cherry Grovers enjoy dancing, dining and indulgence. The shops and restaurants are all brilliantly colored and built on multi-levels, so you can find something for everyone. The special package fare is $32.75 from New York and Brooklyn, and $32.25 from Jamaica. The LIRR package begins May 24 and continues daily through Labor Day, September 1. "The Pines" named for the beautiful wind-sculpted pine trees, is truly an architectural paradise and the largest community on the Island. When you approach from the bay side, you are reminded almost of Monte Carlo or the South of France. Populated in good part by members of the world of fashion and design, it is well known for its upscale social life and beautiful harbor. The special package fare is $32.75 from New York and Brooklyn, and $32.25 from Jamaica. The LIRR package begins May 24 and continues daily through Labor Day September 1. Sailor's Haven, considered the crown jewel of the Fire Island National Seashore, is home to the Sunken Forest – the botanical home to a vast eco-system of plants and wildlife. Sunbathe on a pristine ocean beach or take a walk on the beautiful 1.5 mile nature trail. Guided tours of the forest are provided by the Fire Island National Park Service. A visitors' center with nature exhibits, picnic areas, a snack bar and a gift shop are located on the bay front near the marina and ferry dock. The special package fare from New York and Brooklyn is $30.75, and $30.25 from Jamaica. For children 5-11 years of age the fare is $17. The LIRR package begins May 24 and continues daily through Labor Day, September 1. 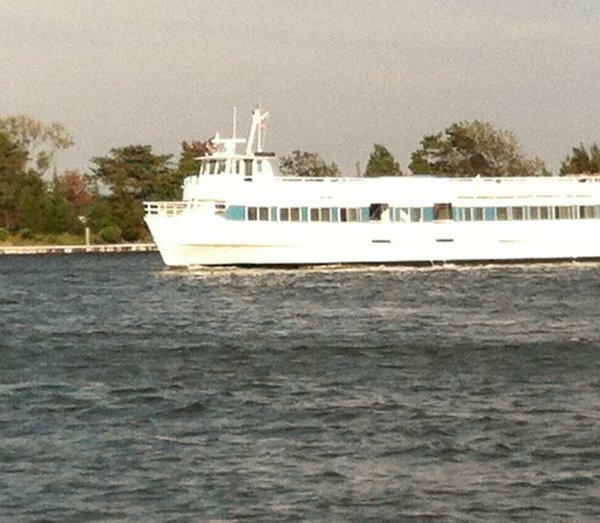 For a schedule of Sayville Station ferry departure times visit sayvilleferry.com. On one end, a huge boat-filled marina, on the other magnificent ocean waves form this community's great landscape. After sunbathing, enjoy the local popular restaurant and bar, with live music and dancing on the weekends. The special package fare is $36 from New York or Brooklyn and $35.50 from Jamaica. For children 5-11 years of age the fare is $26. The LIRR package begins May 24 and continues daily through Labor Day, September 1. Lounge in the sun on a peaceful beach on the secluded shores of Fire Island or walk the nature trails. It’s a relaxing spot for singles and families. The special package fare is $30.25 from New York and Brooklyn and $24.25 from Jamaica. For children 5-11 years of age the fare is $16. The LIRR package begins May 24 and continues daily through Labor Day, September 1. For a schedule of Davis Park ferry departures, visit http://www.davisparkferry.com/. Located on the western tip of Fire Island, Robert Moses State Park offers world-class sand and surf in a casual, less-crowded atmosphere. The Park has five miles of ocean beach, picnic areas and an 18-hole pitch & putt golf course. The special package fare from New York and Brooklyn is $23, and $18 from Jamaica. The connecting S47 bus service, provided by Suffolk Transit, from Babylon Station to Robert Moses operates approximately every half-hour on weekends; hourly on weekdays. The last bus departs Robert Moses at 6:30 PM. For Suffolk bus information, visit http://sct-bus.org/. Daily service begins June 16 and continues through Labor Day, September 1. Captree is a fisherman's haven and a picnicker's delight, so pack a lunch and enjoy a day of fishing while taking in the beautiful views. And no need to bring fishing gear, it's all part of the package price which includes discounted one-day round-trip rail fare, bus transportation and admission on one of Captree’s fishing boats. For a schedule of boat departures visit captreefleet.com. The special package fare is $47 for adults and $30 for children 5-11 years of age. Trains depart Penn Station at approximately 7:10 a.m., 9:05 a.m. and 11:05 a.m., weekdays and 6:57 a.m., 8:57 a.m., and 10:57 a.m. weekends. The trains will depart Babylon Station at approximately 2:36 p.m., 4:35 p.m., and 7:09 p.m. weekdays, and 3:10 PM, 4:58 p.m. and 6:58 p.m. weekends. Daily service begins June 16 and continues through Labor Day, September 1. Click here to see the LIRR Beach brochure. Press the “Getaways/Packages” button on the first screen, then select “Beach Getaways,” then the button for your package or deal. Pay with credit cards or ATM/debit cards. Gray and green machines also accept cash. For additional information on beaches and other LIRR getaway packages customers can log on to: web.mta.info/lirr/getaways or contact the LIRR's Customer Services Center by calling 511, the New York State Travel Information Line, and say: Long Island Rail Road. If you are hearing impaired, use your preferred relay service provider for the free 711 relay to reach LIRR at 511. Subject: LongIsland.com - Your Name sent you Article details of "LIRR Offering a Dozen Beach Getaway Packages"